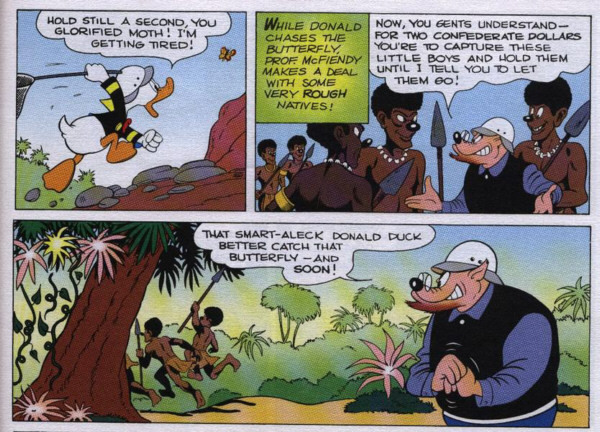 The Donald Duck story "In Darkest Africa" from 1947 is probably the most controversial story drafted by Carl Barks. It is controversial because the story is full of racism. The natives of an African tribe are depicted as totally stereotypical “Africa-negroes”, having thick lips and indulging in cannibalism. Eventually, the original was withdrawn from circulation and various illustrators created a reissue without the controversial content. The original has been lost by now and it was not easy to find the material which is necessary for a comparison. 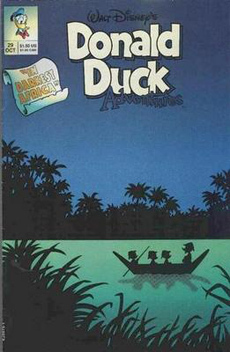 Compared were the original version of 1947 and the reissue which was published in Germany within the Barks Library - Donald Duck #14 (but also in many other publications before), but which is reproduced in the English original version here. As an example for the censorship one can look at page 15. Here, the natives have entirely been redrawn in order to eliminate the stark racism of the original. Apart from the removal of their massively oversized lips, the bones sticking in their ears have been removed, too. 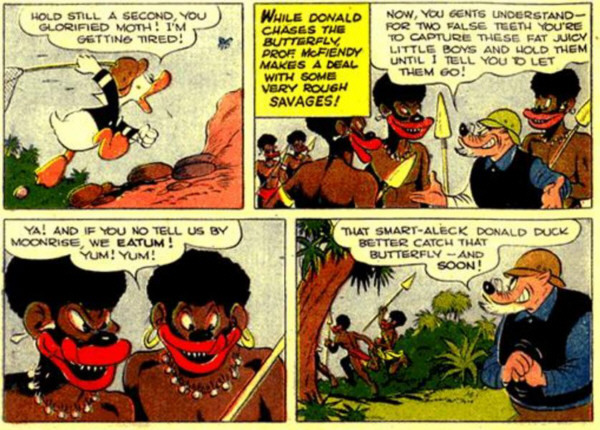 In doing so, one panel, in which the natives openly confess to cannibalism, has been left out as well. These alterations can be found throughout the whole story. Additionally, various other censorships apart from the altered Blacks and the removal of cannibalism in the text have been made. E.g. as a bribe, the natives receive “two false teeth” in the original version, while they get “confederate dollars” in the reissue.